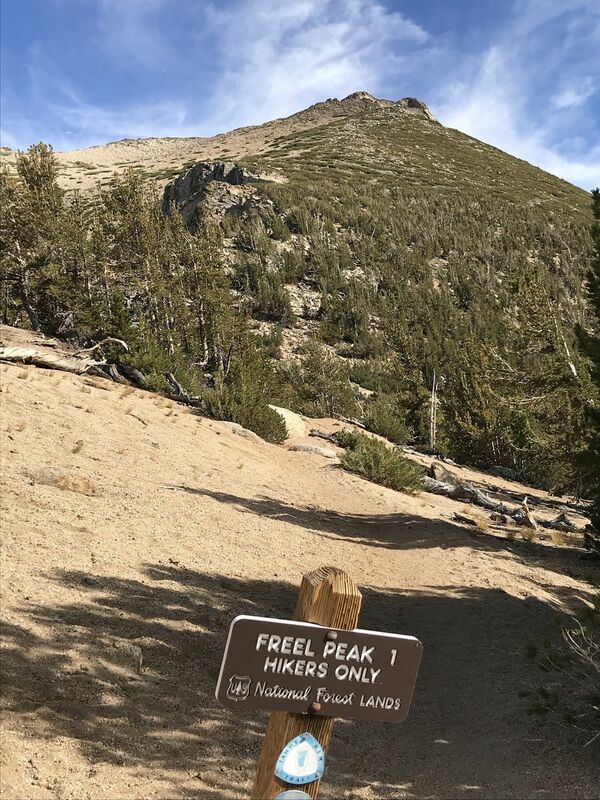 Freel Peak from Armstrong Pass is a 9.4 mile moderately trafficked out and back trail located near Markleeville, California that features a lake and is rated as difficult. 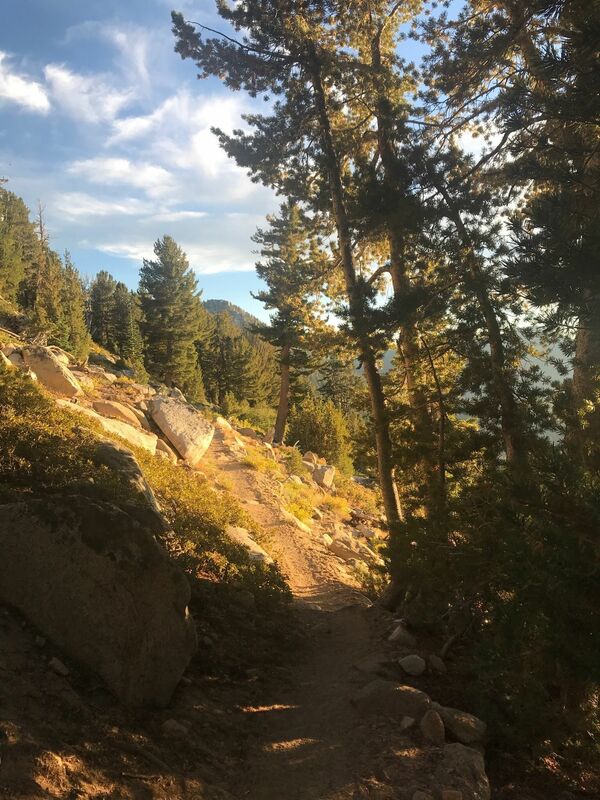 The trail offers a number of activity options and is best used from July until October. Dogs are also able to use this trail. 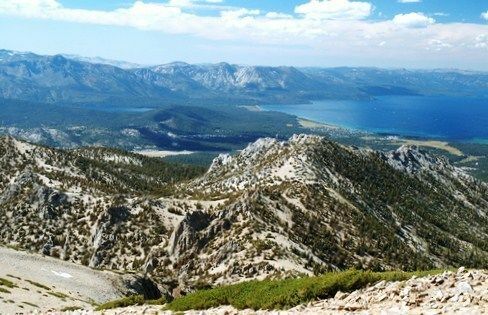 Traverses the path of the Tahoe Rim Trail from Armstrong Pass and then up the scree to awesome vistas. 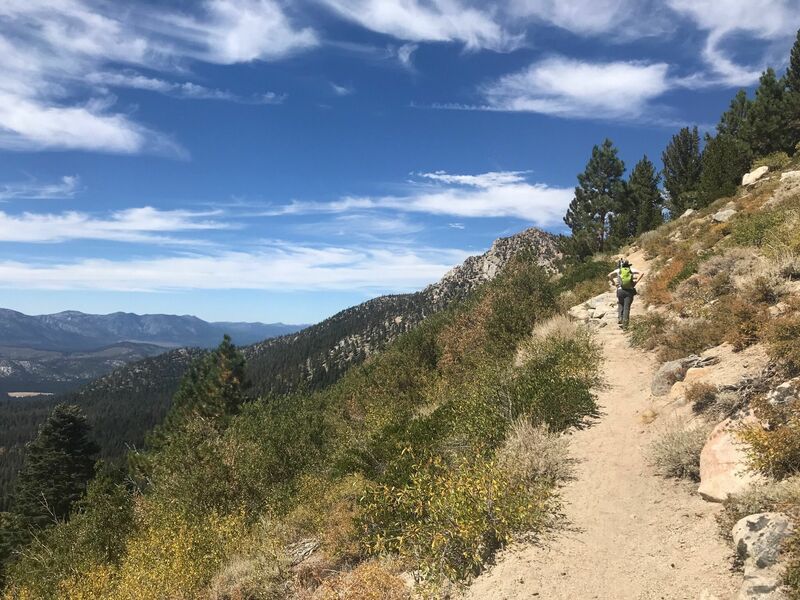 Traversing the path of the Tahoe Rim Trail from Armstrong Pass to the saddle below Freel Peak is the "moderate" portion of this hike, and the final mile to the summit is only moderately-strenuous; however, the vista is breathtaking. 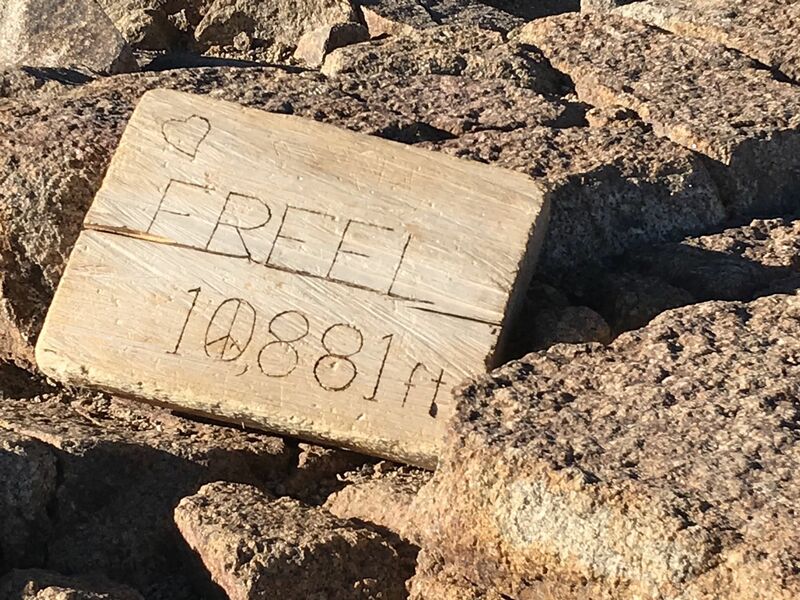 Freel Peak, 10,881 feet above sea level and the highest peak in the Lake Tahoe region, is named for James Freel who squatted on land at the base of the mountain formerly known as "Bald Mountain" and serves as the eastern most summit of the Sierra. 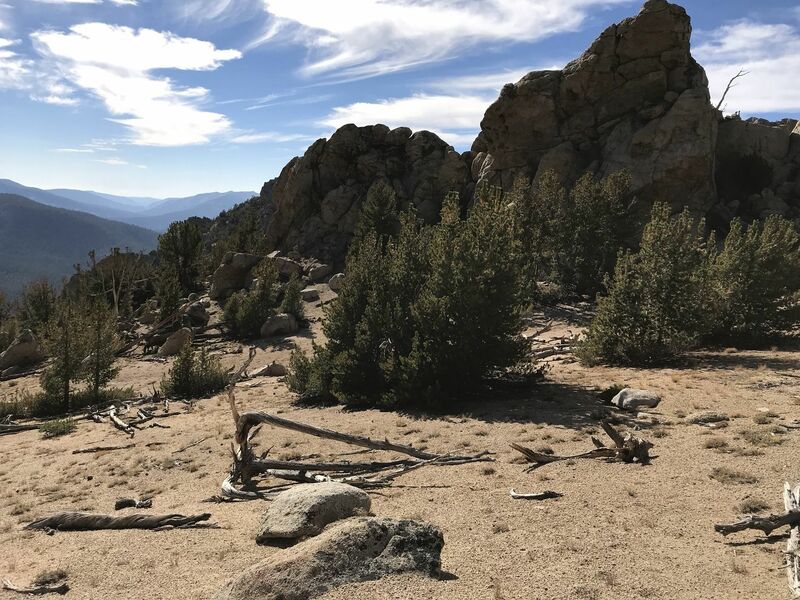 If peak bagging is your thing, Job's Sister and Job's Peak are within easy reach of Freel Peak's summit and would make excellent additions to this hike with minimal effort. Possible seasonal road closures limiting vehicle access. 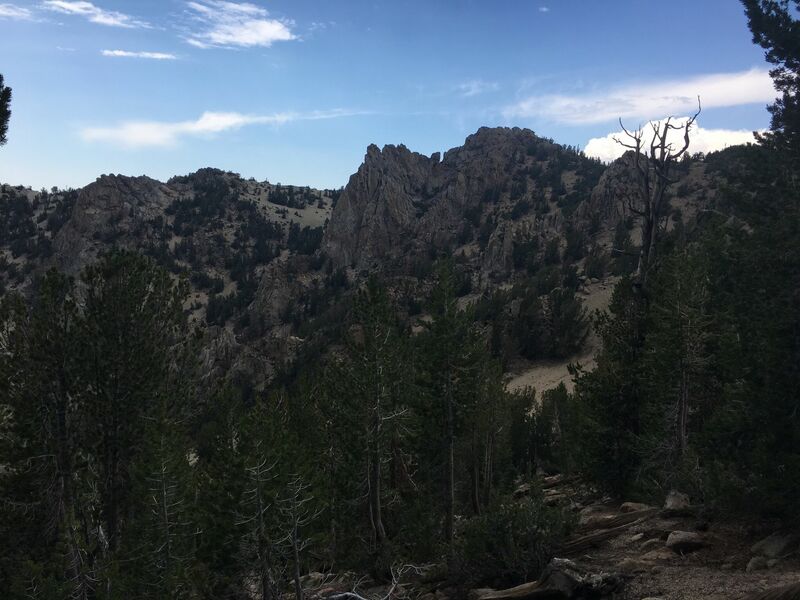 Please check the Alerts & Notices page of the Humboldt-Toiyabe National Forest before your trip. The trail begins on the other side of the bridge crossing Willow Creek heading west from the clearing where you have parked. The bridge is now blocked by boulders, but this was an FWD-OHV trail, once labeled with a non-bullet ridden sign as Forest Road 051I. Walk on this track to a point 0.5 miles west of the bridge where, according to the sign, motorized vehicles must be left. 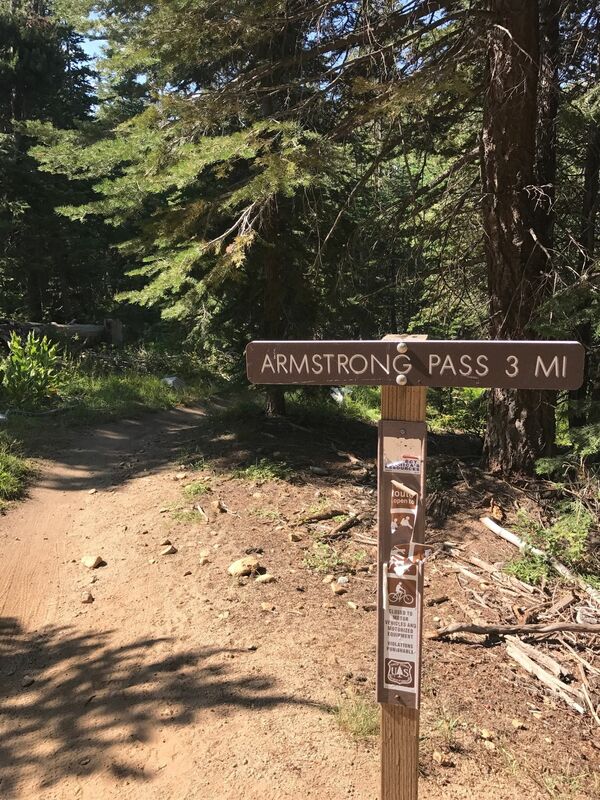 From here, where your single-track begins by following the sign pointing to the TRT, it is less than a half mile to Armstrong Pass where the trail from Oneidas street to the northwest joins the TRT from Big Meadow, nine miles to the southwest. 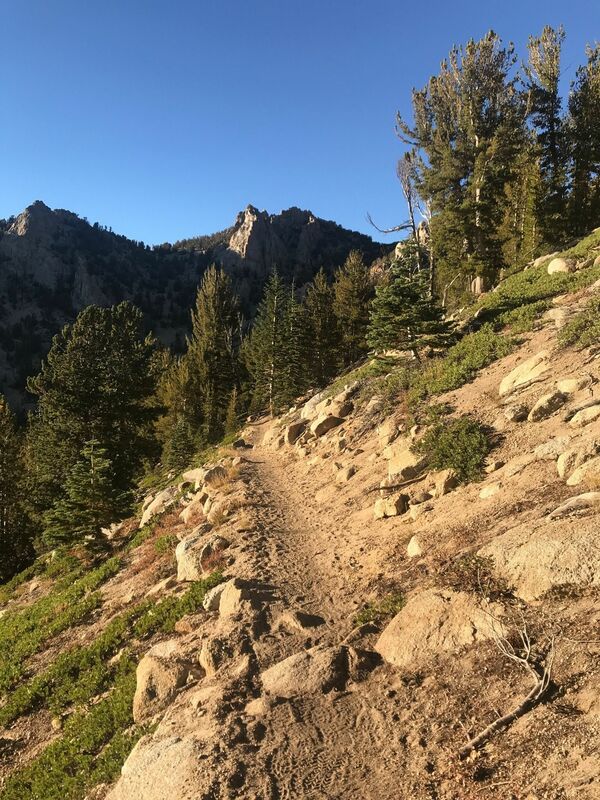 On the way to Armstrong Pass, you will cross a small runoff stream as you swing around the spur of the ridge. Then your track along the TRT will traverse northward on the west slope of the ridge. 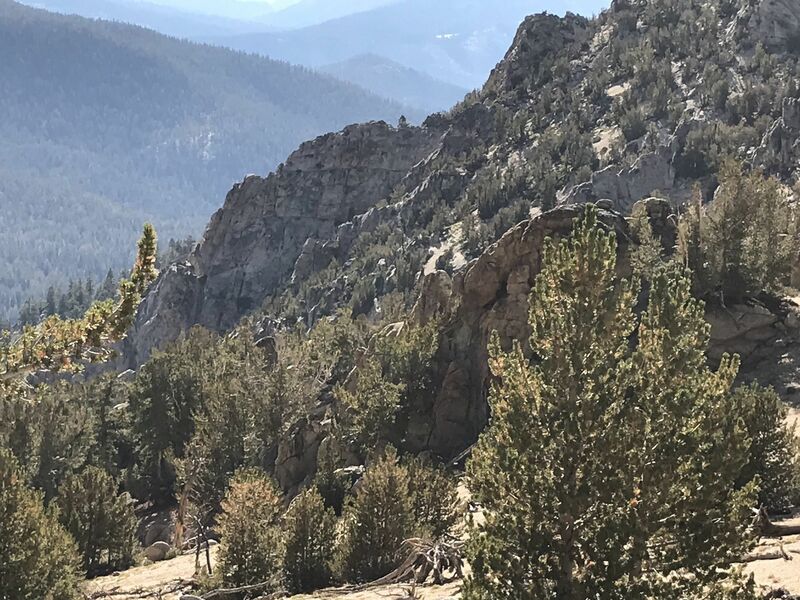 Knowing that your destination is some 2000 feet above you, there is no comfort in your brief descent through scattered boulders before you resume ascending. 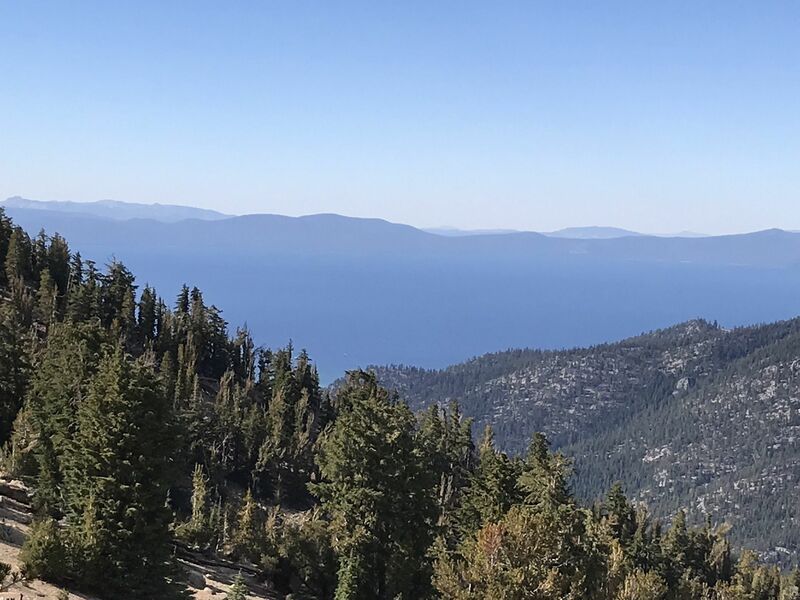 If you start off within an hour of sunrise, your vista of South Lake Tahoe ahead will be spectacularly interrupted by the triangular shadow of your destination as it is silhouetted on the forest below. 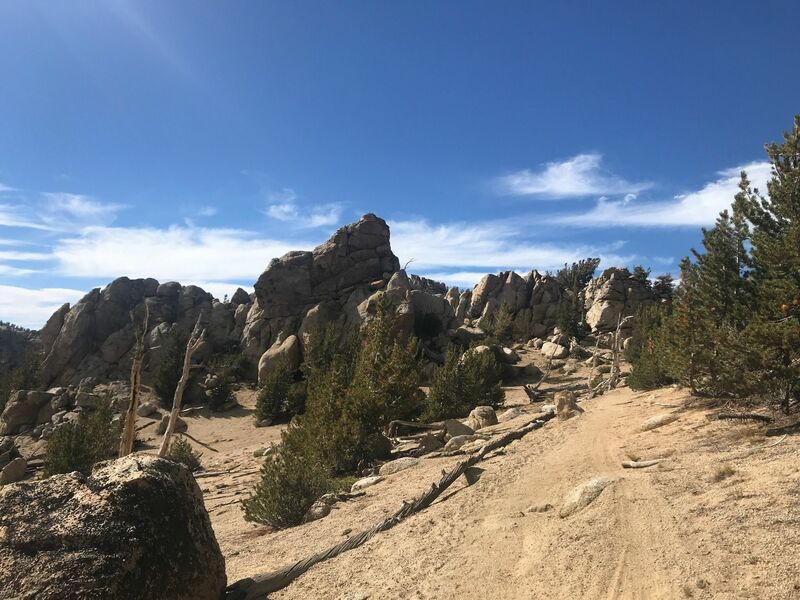 About one mile from Armstrong Pass, the jutting rock outcrop, Fountain Face, looms over your right shoulder as you tread steadily uphill through sagebrush, paintbrush, and rabbitbrush crowding and coloring your trail. 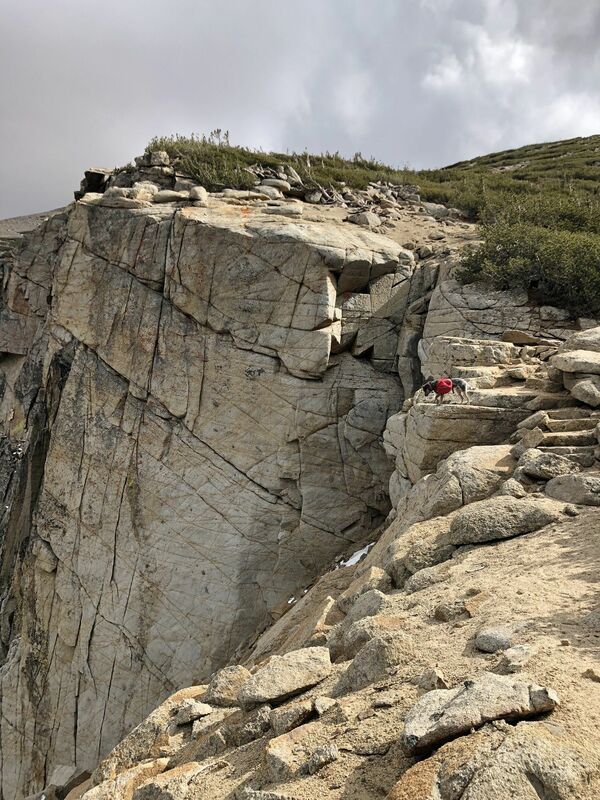 There is nothing about this rock slab to attract serious climbers and anyone else should stay on the trail to a more worthwhile destination. 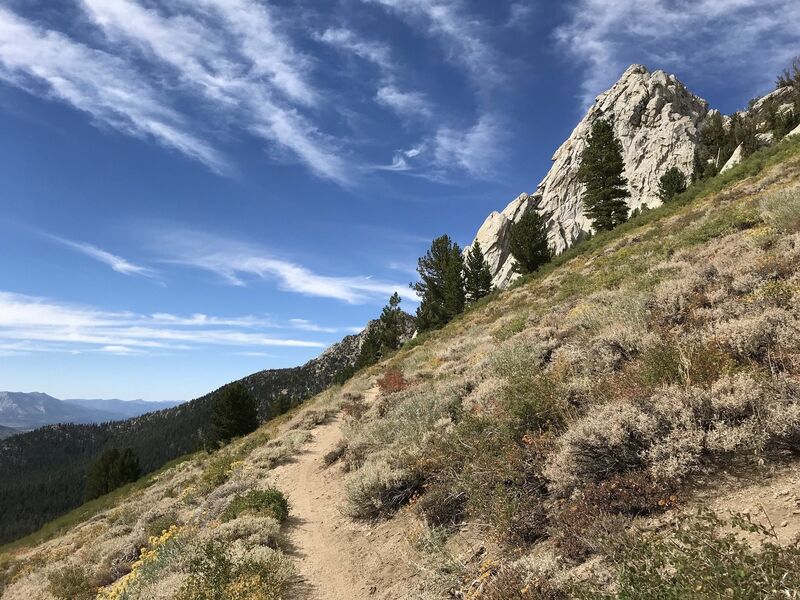 However, Fountain Face is useful as a marker since it is one mile ahead of the only switchback on this traverse. 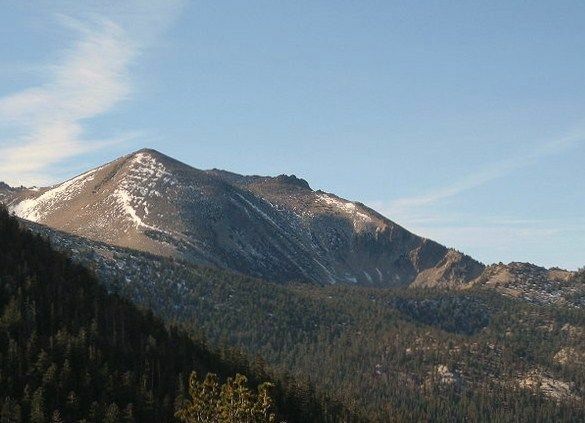 As well, it is two miles from the saddle below Freel; and, it is three miles from the summit. 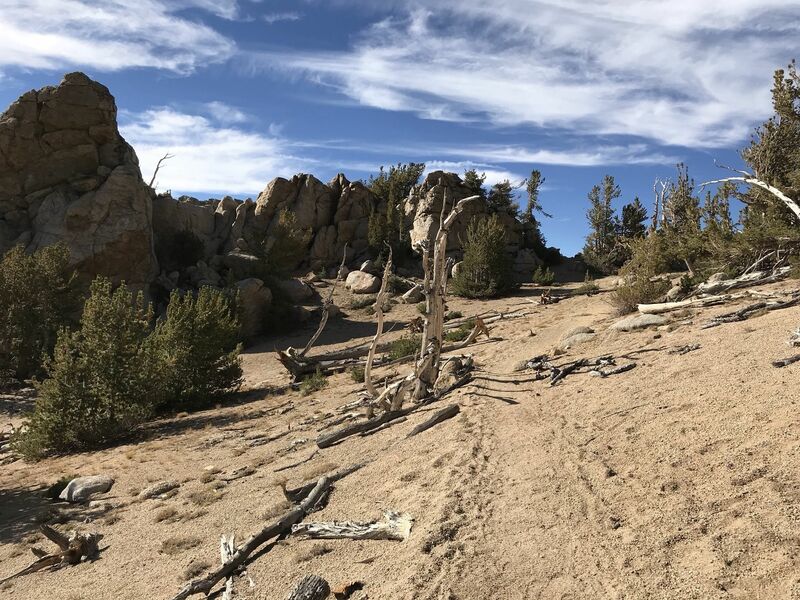 Navigation is no problem on this distinct, mostly sand track bordered by rocks. 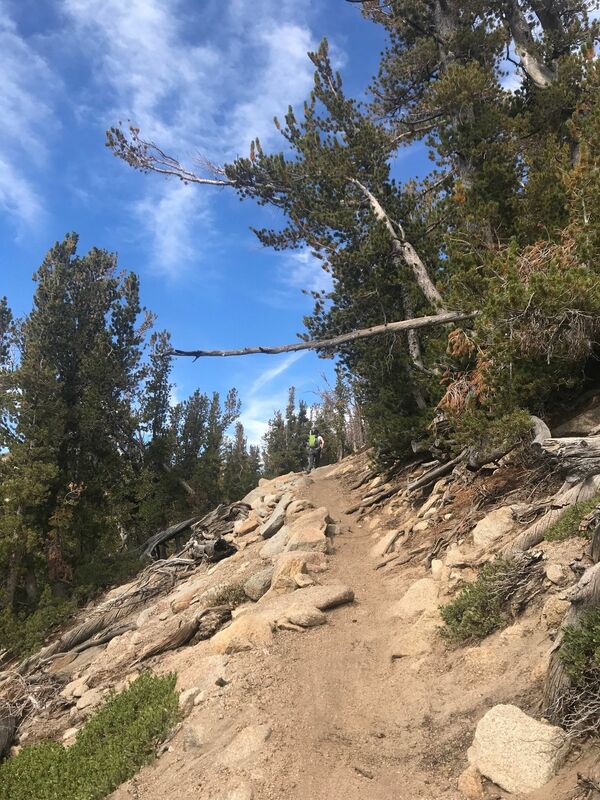 Tahoe Rim Trail volunteers deserve kudos for their efforts along this uphill path as it knifes through the shade of fir and pine. 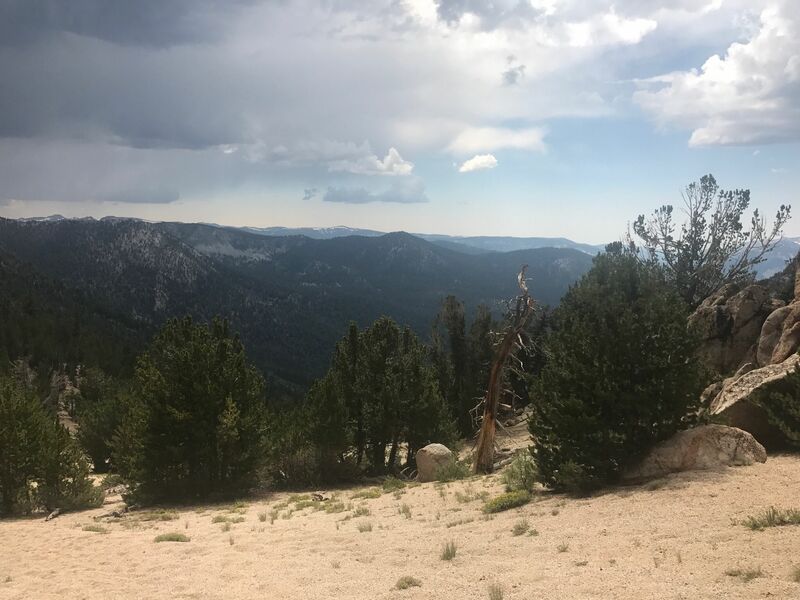 After a brief direction change to the south, your trail resumes its northward direction up to the saddle at just over 9700 feet. 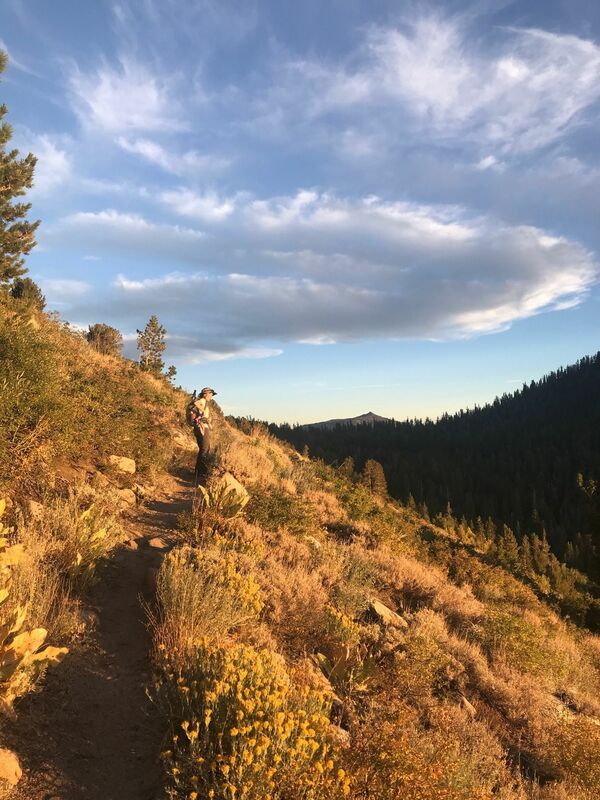 On the way, you will cross three runoff streams in close succession, creating a cool, verdant slope sporting larkspur, lupine, columbine, paintbrush, corn lilies and assorted white and yellow flowers. 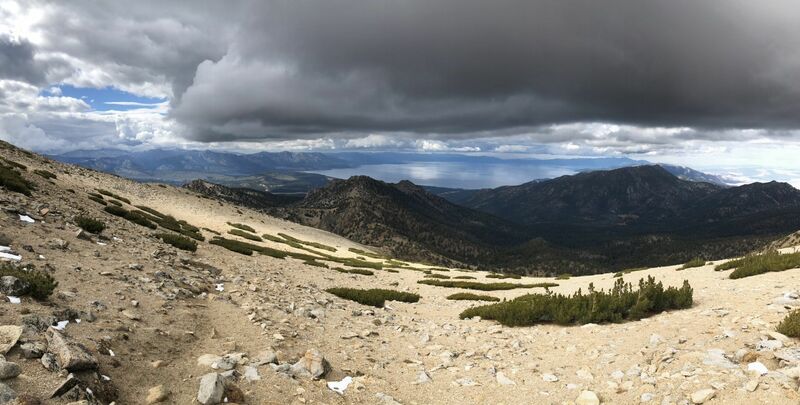 At the saddle, odd-shaped rock outcrops, gnarled trees, and the sparse, ground-hugging plant life are part of the interesting landscape, where you can also look out to Lake Tahoe. 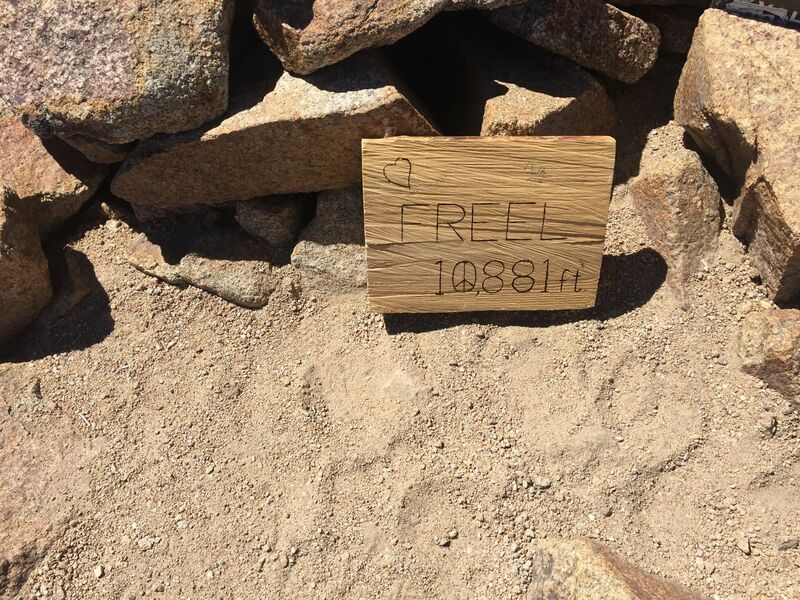 A sign to the south indicates that you are one mile (actually only 1151 vertical feet) from Freel Peak. 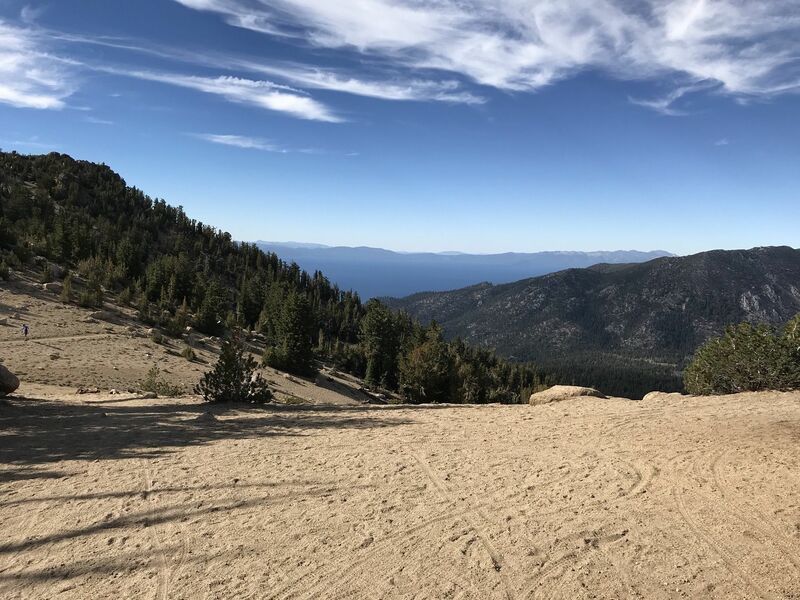 Depart the Tahoe rim trail at this point and head south uphill through the trees. 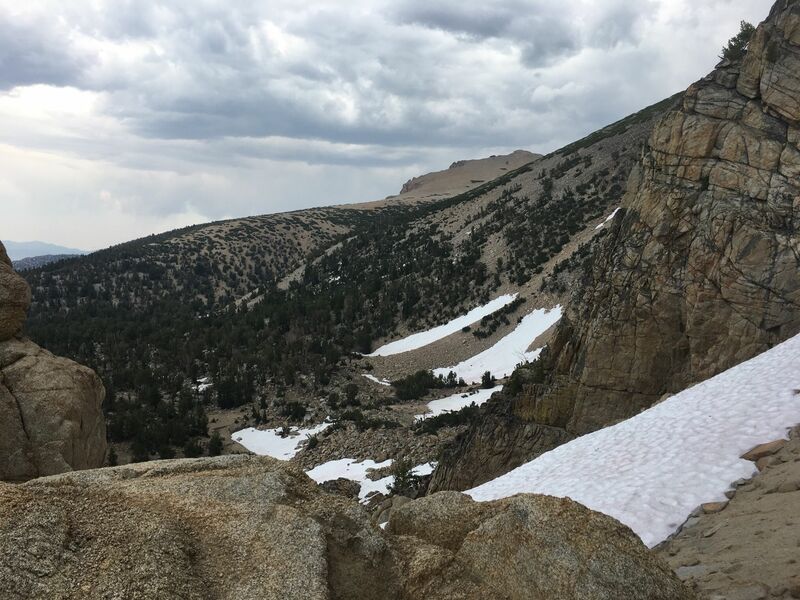 Scree, gravel, and sand bordered by boulders, whitebark pine, and chasms make up the steep but distinct trail to the summit. Plenty of rock steps have been laid to help you up in the steepest sections. 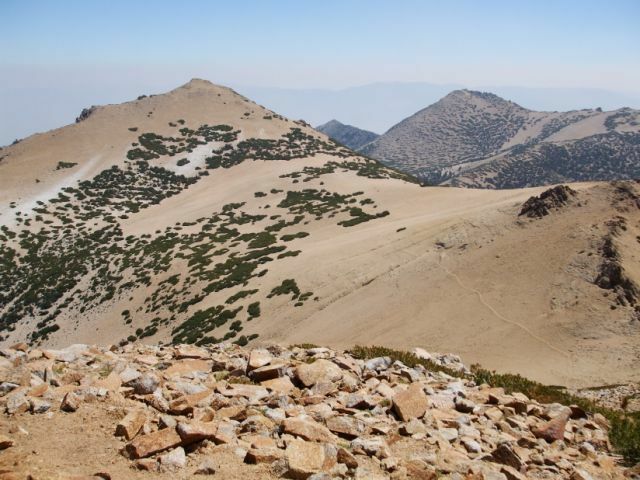 There are about two dozen switchbacks in all which help you ascend this southerly track to the top. Sensitive plant areas are marked - right next to steep drop-offs. Don't tread on either. 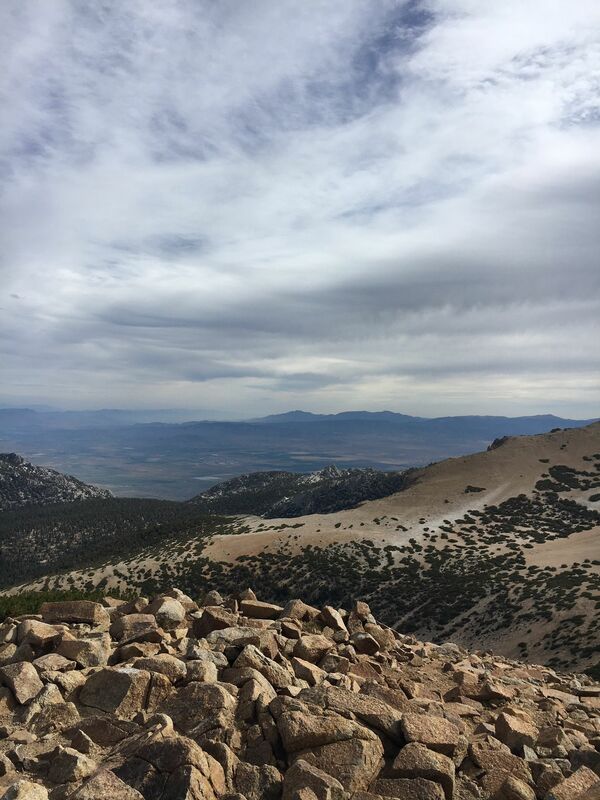 After you cross the 10,000 foot mark, the steepness moderates and the trail traverses an open scree slope east-southeast toward the summit. 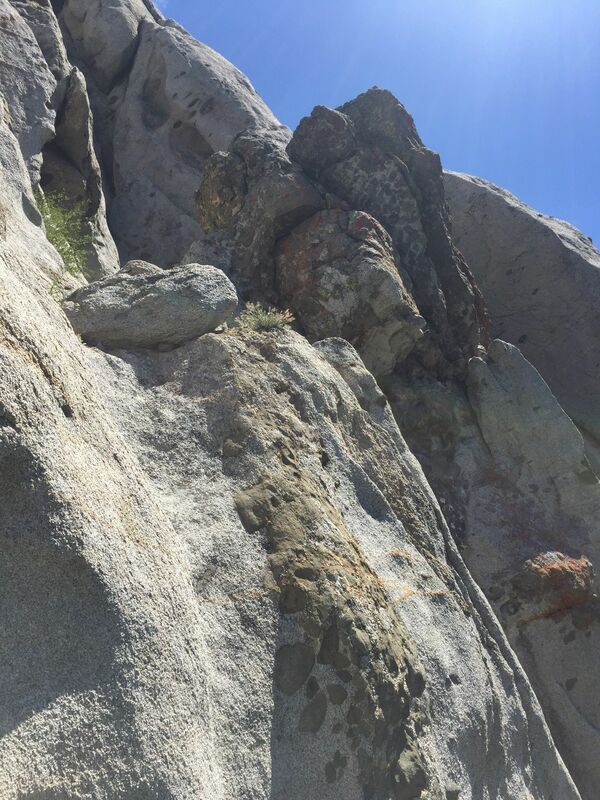 At the top, a quarter-circle of stacked stone breaks the wind for tired hikers. Look among the rocks for the current peak register which is now housed in an ammo-can. In years past, communications antennas occupied the peak, but they have been removed and only their foundations remain. 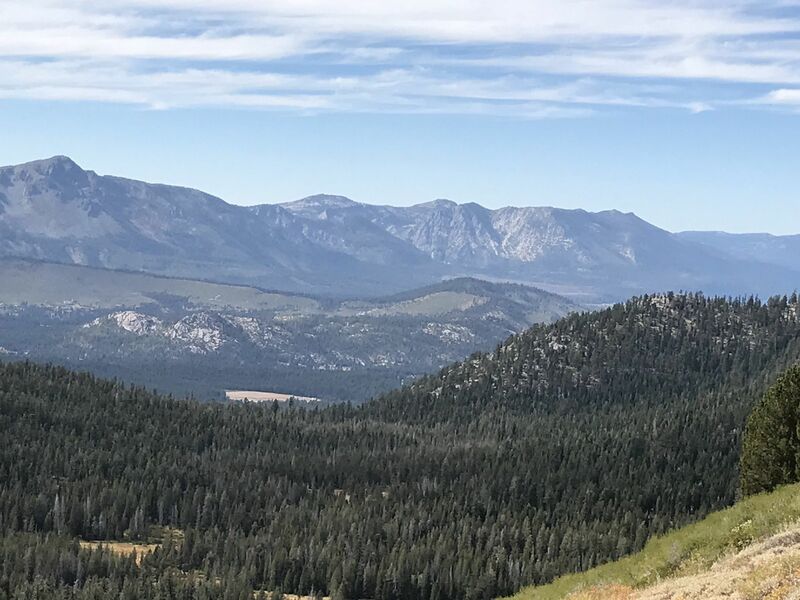 Vistas into Lake Tahoe and the Carson Basin are interrupted only by Freel's companion peaks, Job's Sister and Job's Peak which, as you can see from Freel, are within easy reach. 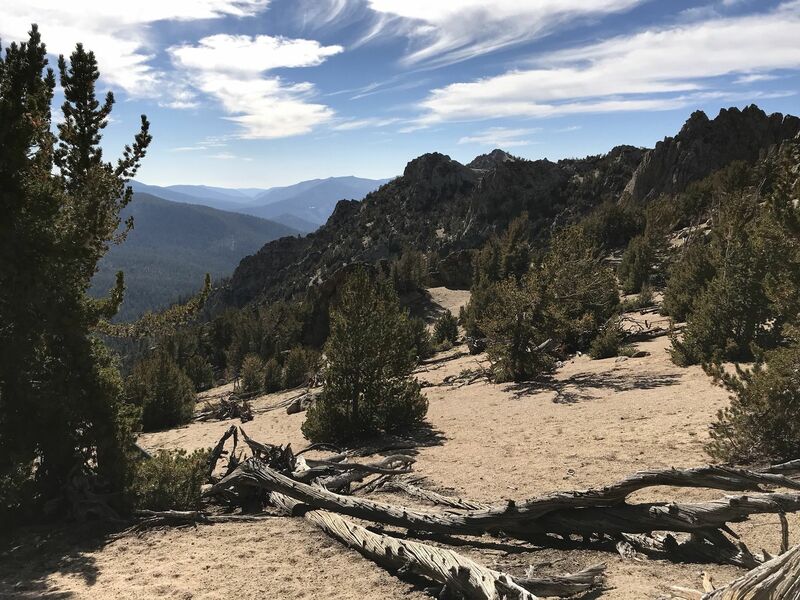 Directions -- From the junction with US-50 in Meyers, drive south on CA-89, 4.0 miles east of Big Meadow trailhead parking area to Willow Springs Road on the east side of the road. 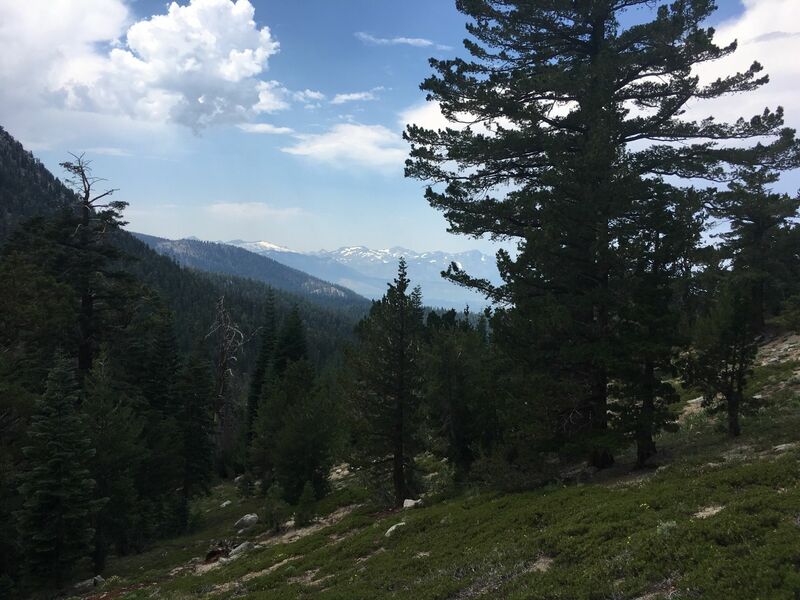 This is the forest service road FR-051 which heads northeast toward Horse Meadow. 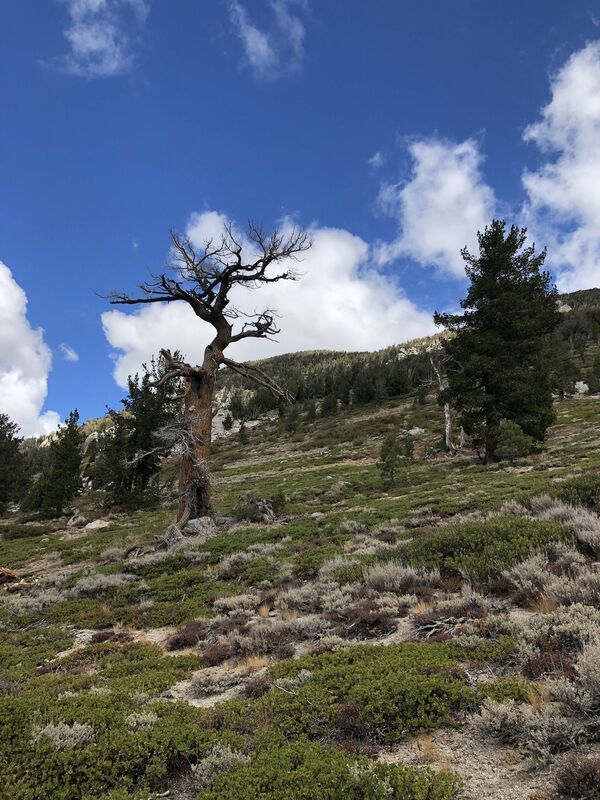 If coming from Carson Pass or Carson City, willow springs Road is 1.75 miles north of the Junction of CA-88 with CA-89 in Hope Valley. It is advised that you use a high-clearance vehicle on this road, however careful driving in a wagon will also get you there. Drive 2 1/2 miles up FR- 051 and cross Willow Creek on the bridge and then drive another mile to cross a second bridge. Park in the open area to the east of the creek branch. A small wooden bridge across the creek is blocked by boulders. And so you've reached your parking spot. 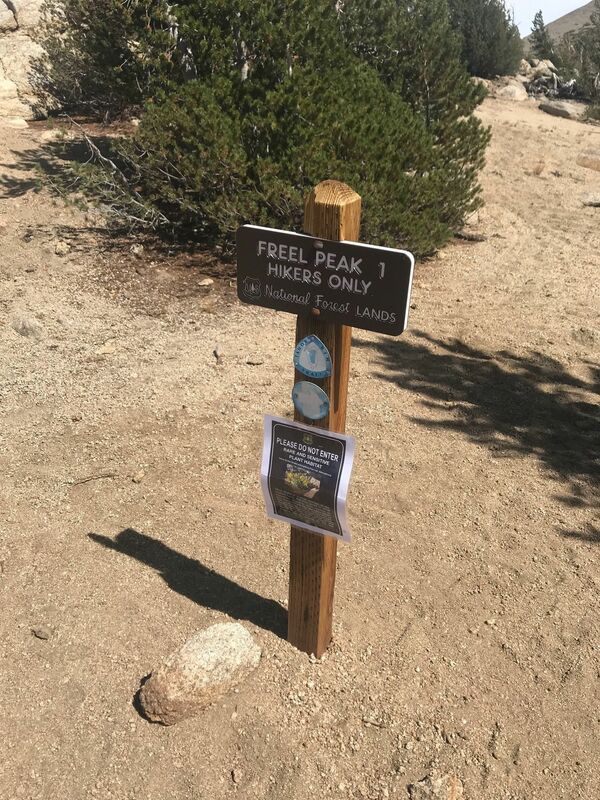 You'll hike for 0.5 miles to the trailhead. 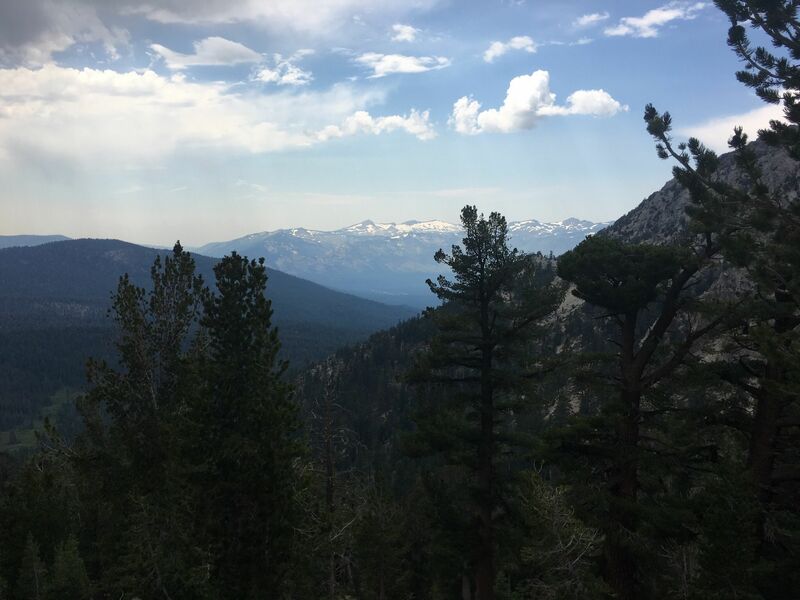 PSA: the gate from horse meadows trail head is closed to vehicles for the season. This hike is becoming one of my favorites. 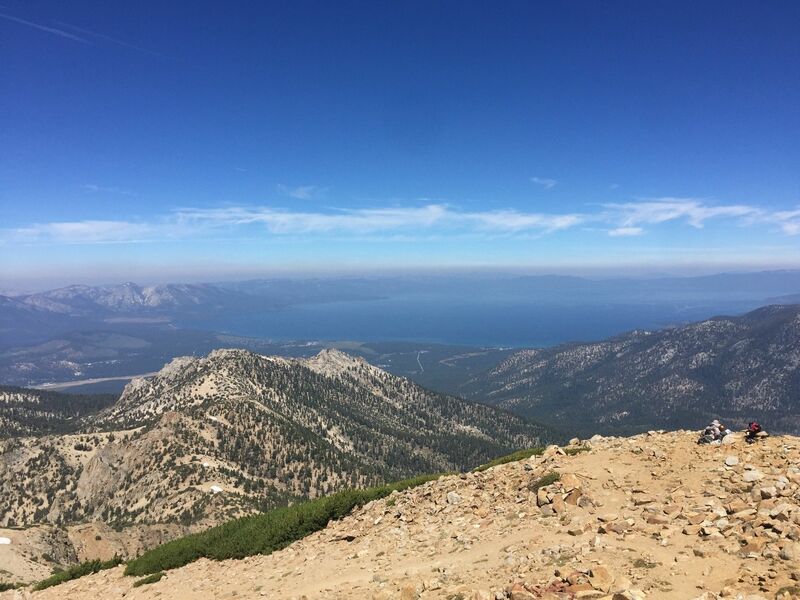 I did it twice this past summer, and the views are simply incredible and worth every ounce of effort you put into it. For me, the most treacherous part of the day was getting to the trailhead on the service road. It is extremely rocky and pothole-y. However, I did see regular sedans and passenger vehicles at the trailhead, so an SUV is not technically required. 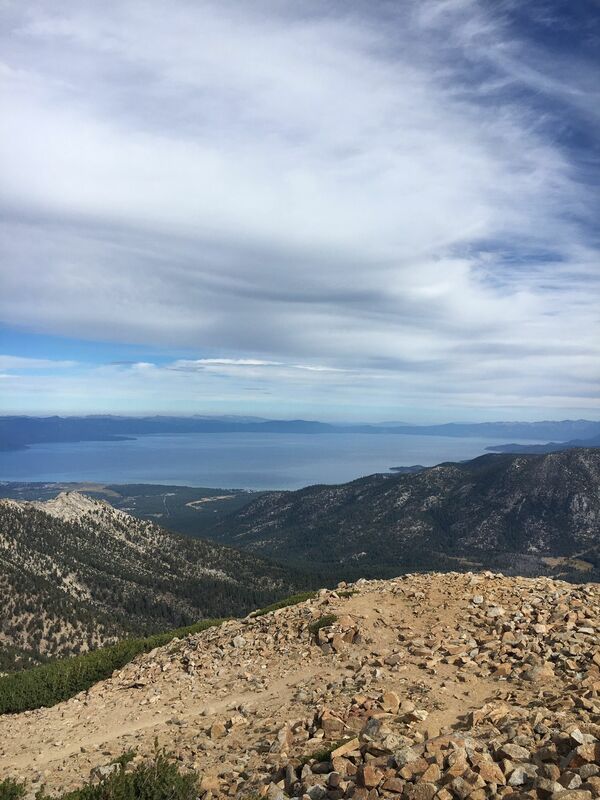 Much of the hike has no shelter from sun or wind, so be sure to bring plenty of water and sunscreen. The cairns along the way were helpful when the trail was difficult to follow. 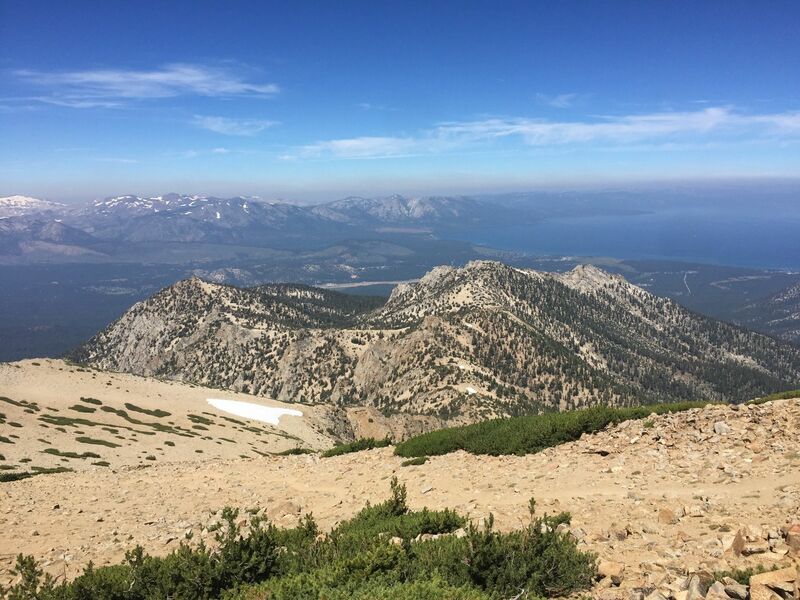 We decided to traverse over to Job's Sister after summiting Freel. It was worth the extra effort, but I did not bring trekking poles with me and I ended up wishing I had. 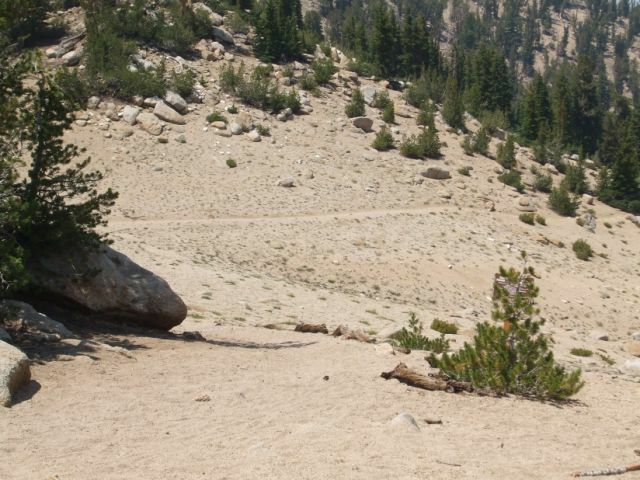 Much of the trail is full of gravel, scree, and sand. Getting back down, we did lose the trail, but it wasn't too difficult to get back on track. 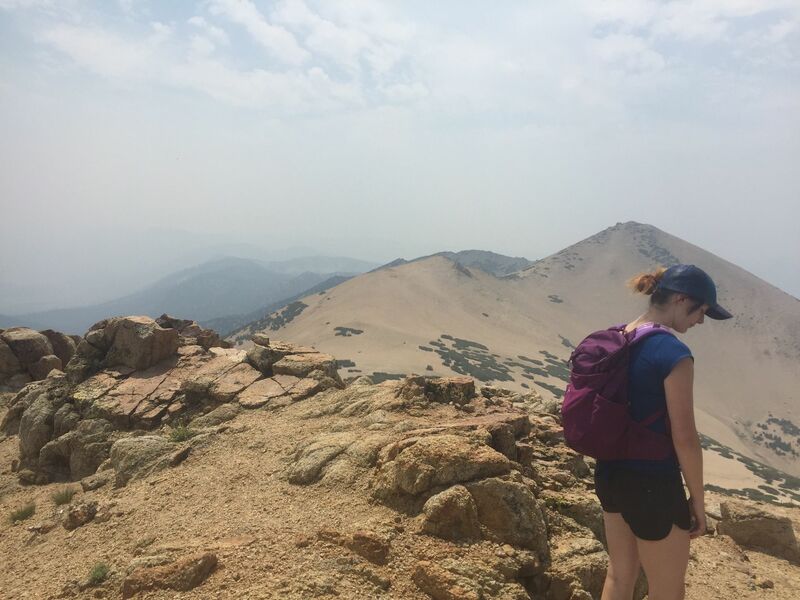 Definitely a five star hike, and I'm looking forward to the next time I can do this one. 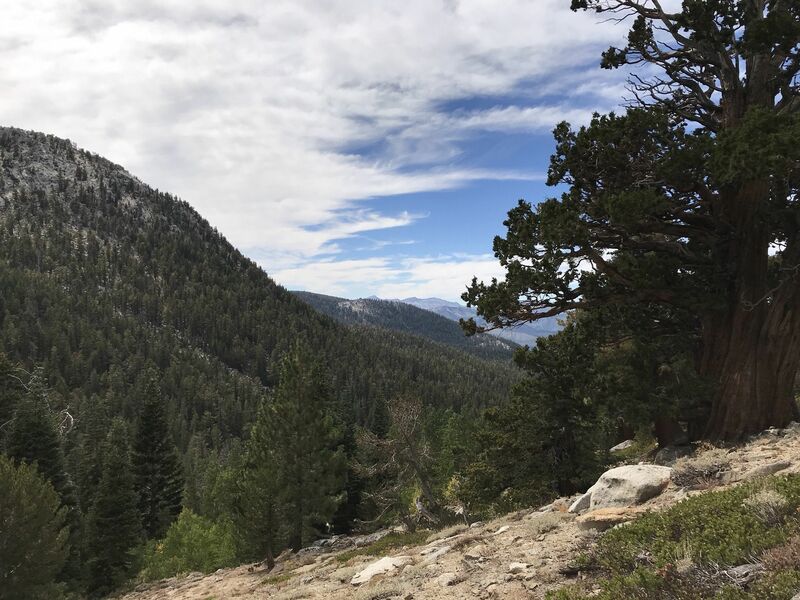 Loved this hike, but it was definitely an advanced hike, and the trails are hard to follow or know where to even start. 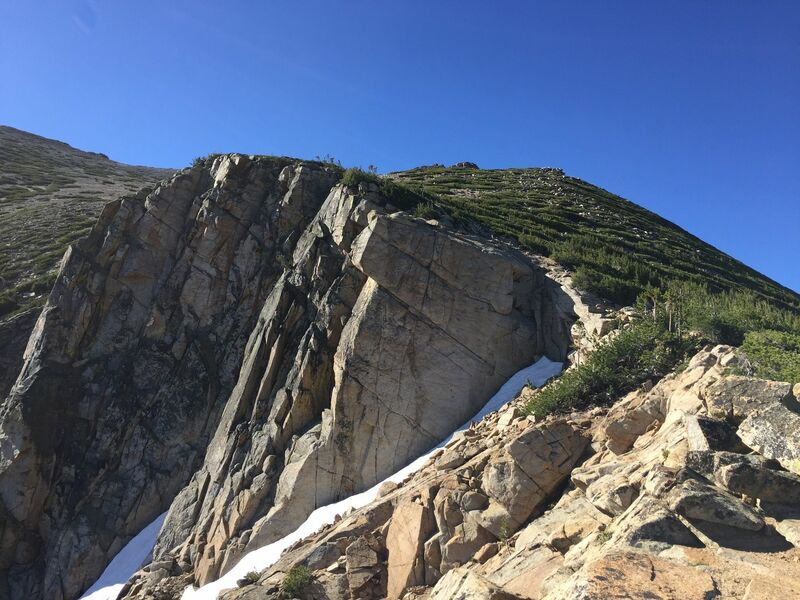 You really need to do your homework on this one so that you know where you are before you head up the mountain. 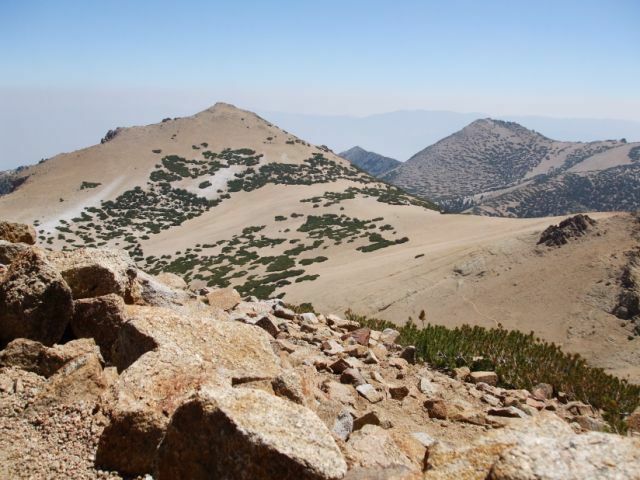 It's a moderate hike via the Armstrong pass to the Freel Peak summit, I am glad to have done this hike.